To an outside observer, it must seem as if smallsats have finally made it big — hundreds of millions of dollars are being invested in the smallsat ecosystem, bolstered by an energetic, ever-growing international community. Whether responding to natural disasters or supporting command and control (C2) of unmanned aerial vehicle (UAV) links and data streams for intelligence, surveillance and reconnaissance (ISR), commercial satellite communications (COMSATCOM) provides the preponderance of Department of Defense (DoD) communication capabilities for SATCOM users across the full spectrum of operations. The small satellite market continues to grow — in interest, investment, capability and potential impact. When U.S. Navy sailors were captured in the Persian Gulf in 2016, many believed the event was caused in part by Iran’s ‘spoofing’ or falsifying U.S. satellite signals. In the early days of space, only governments or large government contractors built satellites and rockets. Today, the space enterprise encompasses many players, including not only governments and large corporations, but also small businesses, universities, and even high schools. The proliferation of small satellites (smallsats) has a large number of new players in the space business as well as new paradigms for access to, and the use of, space. The Space Based Space Surveillance Block 10 satellite operates 24 hours a day, 7 days a week collecting metric and Space Object Identification data. 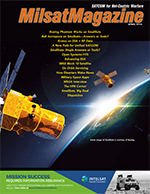 In previous Government Satellite Report (GSR) reports, the discussion at a Washington Space Business Roundtable (WSBR — www.wsbr.org) event that featured an all-star panel of space experts discussing on orbit servicing of satellites has been reported. Disasters make news — whether the catastrophe is an act of nature or humanity, we want to see it with our own eyes and share the experience of the people whose lives are turned upside down. A large share of satellite and space technology can be traced to military development and deployment activities — ranging from GPS to communications to Earth Observation (EO), space-based systems have, over time, taken on military and commercial or public uses that permeate everyday life. The hurricane season of fall 2017 will be remembered for a long time. The major hurricanes Harvey, Irma and Maria, roared through the southeastern United States and the Caribbean. Lives were in jeopardy as observers wondered how they could help. A flock of Doves takes detailed pictures of the entire Earth every day. You’ve probably seen their photos, or read a headline informed by the data they gather. What can the Army learn from these birds and the former NASA engineers who sent them aloft? Lower cost. Increased flexibility. Less lead time. These are more than just buzz words in today’s space environment, these are goals that the industry is demanding, needing, running toward — and while changes in an already successful production process can seem intrusive, RUAG Space has actually found its niche in this element... a niche that addresses the crucial needs of commercial, as well as agency/government. With a sense of accomplishment and pride, the leadership of the Hosted Payload Alliance jointly authors this month’s HPA Corner to announce our milestone transition.